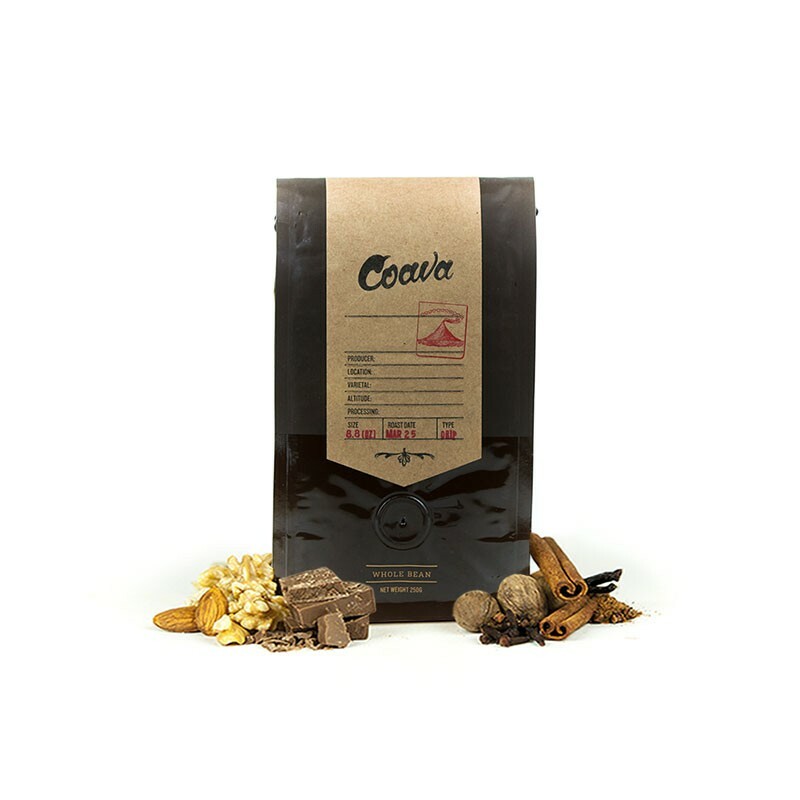 This is the Brazil Santa Luzia brought to you by Coava Coffee Roasters. This pulped natural coffee was grown by Jose Maria de Oliveira in the Minas Gerais region of Brazil between 1,200 meters above sea level. Enjoy the mellow, rich cup with candy bar notes of chocolate, caramel and nuts. Rich earthy chocolate notes, accompanied by a nutty finish. I tried this both as a pour over and a press; as a press it becomes bolder with more hints of nut, and as a pour-over you have a cleaner and more balanced flavor. I would recommend this to people who like a smoother medium roast. This coffee has an "earthy" taste to it. I was not a huge fan of the notes, but I did like the roast. I would be interested in trying a bean with citrus or fruit notes from this roaster. So smooth and rich, what a cup first thing in the morning! Snickers candy bar flavors throughout. Chemex brewed. The past several have been very tasty. Definitely like the direction these address going. A simple, no-nonsense coffee. Earthy tones with only a slight acidity. Doesn't push the envelope, it's just comfortable and familiar. But sometimes that's exactly what you want. A nice, mellow coffee with a soft profile. Tasting notes of toffee, caramel, and cocoa. Good, not great. The standard Brazil, not much else. I was just kind of eh about this one. I don't dislike it, but I don't get excited about it either. Not as "special" tasting as some of the other coffees I've received. Almost no acidity, however not much complexity either. Strong hardwood smoke, tobacco on the nose. Prunes and plums on the palate. Moderate richness/mouthfeel. Feels a bit underwhelming. Nothing in particular strongly stands out - tried both pour over (hot) and slow steeped (cold). Small bean size, almost peaberry sized. Packaging is super cute, but the brew is fruity, which I personally detest. Absolutely loved this. It was a little light but the flavor was amazing. I'm a big fan of this Oregon roaster. This did not disappoint. Very solid offering. A very nice coffee. But not the best for a French press. I found if the water was too hot the coffee would easily become more bitter and lose it wonderful notes of chocolate and caramel. If the water temp was just right this coffee was amazing. If it was too it lost a lot of flavor and became bitter. This coffee has a great beginning, middle and end. Good notes of chocolate, hints of tobacco to give it a strong back bone. It's a good sip throughout, just tends to be a little one noted throughout the cup. Good, but quite sour if brewed in a french press. I didn't love this one.. Maybe too much caramel..? Initial citrus morphs smoothly into mocha followed by a resonant, clean finish - an amazing and drinkable coffee. This roast is strictly a drip coffee, and I use the pour over method primarily. Although the the tasting notes are caramel and nuts, the first note I tasted was plum! It was delicious coffee! Middling and unremarkable, though my preparation (French press) probably didn't do it any favors. Very smooth and drinkable. One of the best so far. strong nut smell when grinding.....but very light to taste (which is good!). I enjoyed this cup nothing to special. Better in aeropress vs drip. Wife liked the drip. Would have given 3.5 if possible. Adding this: I have refined my brew a bit, aeropress 17 grams, with 200 degree water, fill aero 1/2 30 seconds stir, fill the rest, wait 75 seconds, and press. Using inverted method this comes out with nice balance, somewhat nutty and a nice cup. Better than my first impressions, still a 3.5 star but enjoying it more. Delicious cup of coffee. Nice body, with plenty of cocoa notes. Ironically, I think this makes a better cup of espresso than pour-over (based on the description, I'd have predicted the opposite). I have not made a bad cup of espresso from the Santa Luzia--all are well rounded, nice nonspecific citrus notes, balanced and blended with a full mouth midnote. Couldn't be happier with it. Absolutely beautiful cup of coffee! Perfect blend of delicious goodness!!! Right on the money! We really enjoyed this coffee! Brewed it in a pour over and it has a silky mouthfeel. It's slightly nutty, savory without being overly salty and caramel-y.